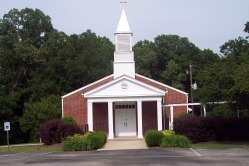 ​Morning Sun Cumberland Presbyterian Church is located at 2682 Morning Sun Road in Cordova, TN. Sunday School for all age groups begins at 10am and Worship begins at 11am. Whether you have been a "church-goer" all your life, never been to church, or haven't been in a long time - you will be loved and welcomed at Morning Sun. Come as you are! Our dress code is the armor of God! We would love for you to join us! Mission Statement: Families working together to do God's will. Come join us at Morning Sun, where the Son shines! and praise your Father in heaven."